We promote savings-through-dependability improvements of your equipment and components. 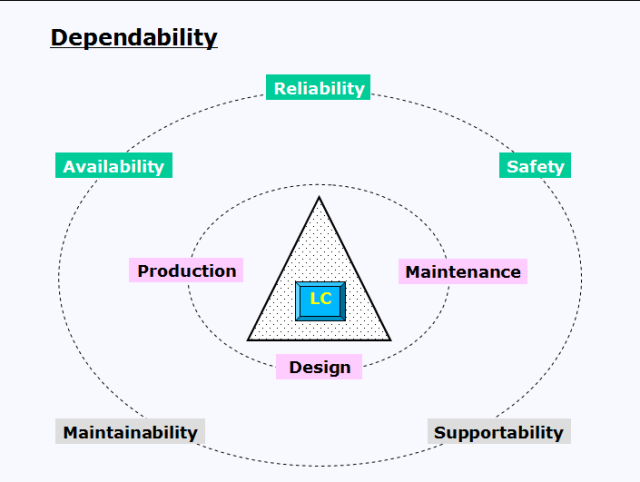 The word dependability means ability of a system (asset) to perform a required function under given conditions for a given time interval (including failures and maintenance). Failure rate prediction of components. At the end it should be possible to calculate the failure rate of the complete system (asset). For a system (asset) the dependability and the reliability can be calculated or analysed from the failure rate of each component. The structure of the system is described in a block diagram which shows the system (asset) from the perspective of dependability or reliability. FMEA is another approach to determine the impact of component failures. The consequences on the component and the entire system are described. The analyse can be qualitative or even quantitative depending on the purpose of the analyse. If system failure can occur as a result of a combination of several failures, other methods must be considered. FTA is a method for analysing complex failure situations. It gives good understanding of dependencies and how failures occurs. FTA is used in Probabilistic Safety Analysis (PSA). For all failing systems or components, maintenance is a key factor. Regardless of how maintenance is performed questions like which tools and test equipment, which training and support are needed will rise up. Systems (assets), subsystems or components which fail can either be repaired or discarded. In the repair-discard analyse are considered both technical and economic aspects. This analyse must kept up to date during the entire life-time. Technical aspects consider the possibility to repair. The economical aspects covers e.g. man-hours, equipment, spare parts, storage, transportation, outsourcing and administrative costs. The analyse shows which alternative would be the best solution. LORA is designed for systems, subsystems or components needing maintenance. It covers preventive and corrective maintenance. The word "level" indicates on which level maintenance and repair should be performed: e.g. by the operators, dedicated maintenance personnel, specialised maintenance workshops or by suppliers. LORA is useful in larger organisations (airlines, transport companies, cement or mining industry and car industry). In the field of heavy maintenance and repair LORA is a very helpful tool for optimising spare part costs in function of operational consequences. Often, spares are the largest part of maintenance costs. The aim should be to find a cost-effective assortment of repairable spares to fulfil dependability requirements such as operational availability. The aim of this approach is to achieve a more cost-effective system (asset). Life Cycle Profit / Life Cycle Cost analysis are very important as they gathers information from other analyses and focus on economical aspects. Inventory costs are includes in the Life Cycle Costs. Life Cycle Profit / Life Cycle Cost analysis consider the system (asset) and the necessary support. Often it becomes evident that few of the cost elements represent the major part of the actual costs. This gives a hint on where to focus in order to achieve highest cost-effectiveness and sustainability with design or dependability improvements.